It’s not chemistry between Tinka Foster and Sam Anderson that made them agree to fake date. With her parents trying to set her up with an annoying pro-track golf student, and intentionally single Sam’s family pressuring him to bring a date to his brother’s wedding, they could both use a drama-free summer. 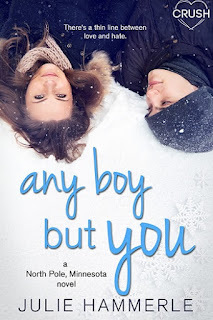 Artificial Sweethearts is the second installment in the North Pole, Minnesota series and can easily be read as a standalone. Some mentions of the past book, and cameos by past narrators, but it doesn't affect the overall plot or lead to any confusion. To be honest, I struggled to fall into the story during the first chapter. Tinka's narration, while being picked up at the airport, there were plot holes being purposefully left open for later, to add a mystery/suspense vibe, but it was the execution that made the narration jarring. I liked Tinka's character, but the style in which it was written was difficult to navigate. Bumpy and all over the place. As soon as Sam was voiced, I was hooked immediately. Sam was a chubby boy. He's the helper/giver, non-complainer. The one who is easily taken for granted. He's helping his big brother plan a wedding (do everything), with his younger sister running off to camp, and his baby sister is too young to help at all. So everything falls on his shoulders, and he doesn't say a word about it. Now slim, after doing yard work and probably shedding the baby fat, Sam is still stuck in that mindset of being the chubby, invisible, always happy boy, and siblings will always see you how you used to be, not how you are now. Tinka is also a giver, but she lacks self-reflection. It's hinted at that she's a bad girl (no shaming, her actions were a cry for help, not because she was enjoying herself and feeling empowered by it). But, being inside Tinka's head, the reader knows the core of her, even if that's not the perception others have of her. She's hurt her friends in the recent past, but her parents are hurting her. Their personalities are complementary, neither one having a voice in their family, just going with the flow. Together, they try to find their voice. Yes, there is a tiny bit of angst, but not truly between Sam and Tinka – it's with Tinka's friends and family, and Sam with his family and friends. Sam is a solid guy, and he takes Tinka at face-value because she opens up to him and is 'real,' and he's the same way back. No tension, they're relaxed together, like finding home and finally being able to breathe. So there isn't miscommunication central between them, even with the 'fake-dating' to keep their family off their backs. For two-hundred pages, the journey is Sam and Tinka finding a voice – no longer avoiding conflict because it's easier on everyone else while costing themselves dearly. They learn to stand up for themselves, ask for what they want, and make no apologies for it. We only get one life, and we're the ones who have to live it. I felt this a great message, one people need to learn – the younger the better. I thoroughly enjoyed Sam and Tinka's journey, and look forward to both more in this series and by this author in the future. Definitely recommend to fans of the young adult genre. Young Adult age-range: 12+. Kissing. For reviews & more info, check out our Any Boy But You post. Reviewers on the Wicked Reads Review Team were provided a free copy of Artificial Sweethearts (North Pole, Minnesota #2) by Julie Hammerle to read and review.